Chapter 1. Recent Developments in the Theory of Regulation (Mark Armstrong and David Sappington) This chapter can be viewed as a successor to the chapter by David Baron in the original HIO, and to a lesser extent those by Ronald Braeutigam and by Roger Noll. Relative to the Baron chapter, this chapter focuses more on practical regulatory policies and on multi-firm regulation. Chapter 2. The Economic Analysis of Advertising (Kyle Bagwell) This chapter discusses advertising, which received a brief treatment only in passing in the first two HIO volumes. More generally, this chapter fills a larger gap, as we know of no thorough modern survey of this large literature. Chapter 3. Empirical Models of Entry and Market Structure (Steven Berry and Peter Reiss) This chapter describes empirical models of entry and exit that infer aspects of firms’ competitive environment from the number of competitors in a market. The focus is on within industry comparisons, say for example on differences across separate geographical markets for the same product. Chapter 4. A Framework for Applied Dynamic Analysis in IO (Ulrich Doraszelski and Ariel Pakes) As theoretical dynamic models increase in complexity, in order to reflect a wide variety of possible economic environments, it has become increasingly difficult to obtain analytic characterizations of equilibrium outcomes. This chapter surveys methods for deriving numerical solutions in such games. With increases in computer processing speed and memory, it has become possible to analyze a richer set of environments, and to revisit issues such as mergers, where long run effects on entry and investment may be paramount. Applications of these numerical solution methods have just begun to be introduced in the empirical analysis of dynamic oligopoly games, and we believe that some important advances will occur in the near future. Chapter 5. Coordination and Lock-In: Competition with Switching Costs and Network Effects (Joseph Farrell and Paul Klemperer) These issues are prominent in markets where there are either direct or indirect benefits to purchasing the same product as many other customers, or where there are other costs associated with switching products. Again, this topic was not covered substantively in the first two HIO volumes. Chapter 6. An Empirical Perspective on Auctions (Ken Hendricks and Robert Porter) This chapter describes the empirical literature on auction markets. Auctions are an important trading process, and they have been widely adopted in sales of public assets. Economics has informed the design of auction mechanisms, as well as the analysis of bidding, such as the detection of collusion. Chapter 7. A Primer on Foreclosure (Patrick Rey and Jean Tirole) This chapter surveys the literature on foreclosure, whereby output in one market is restricted by the exercise of market power in another market. Related chapters in the earlier HIO, by Martin Perry, by Janusz Ordover and Garth Saloner and by Michael Katz, touch on these issues. There have been a number of subsequent developments, spurred on in part by several antitrust cases. Chapter 8. Price Discrimination and Competition (Lars Stole) This chapter expands on Hal Varian’s earlier chapter in the HIO. Varian’s discussion largely focuses on monopoly price discrimination, while Stole’s chapter is primarily devoted to the more recent literature on price discrimination in oligopoly markets. Chapter 9. Market Structure: Theory and Evidence (John Sutton) This chapter describes the determinants of market structure, including the size distribution of firms and industry turnover. In contrast to the related chapter by Berry and Reiss, the focus is largely on differences across industries. 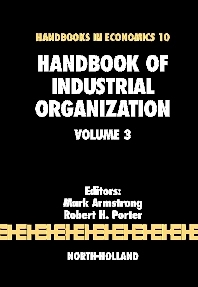 This chapter is a successor to the chapters by John Panzar, by Richard Schmalensee, and by Wesley Cohen and Richard Levin in the original HIO volumes. Chapter 10. Antitrust Policy Toward Horizontal Mergers (Michael Whinston) Finally, this chapter discusses horizontal integration. This chapter succeeds that by Alexis Jacquemin and Margaret Slade in the original HIO volumes. It supplies an up-to-date account of the latest theory in the area, as well as recent developments in policy in the United States and Europe. Professionals, consultants, academics and graduate students in the field of industrial organization.